Caps are only stocked in clear polypropylene material, but may be paired with any color base. NEW Grip Paks provide individual packaging for end mills, drills, solid carbide tooling and other cutting tools. They provide ideal protection and excellent presentation display. 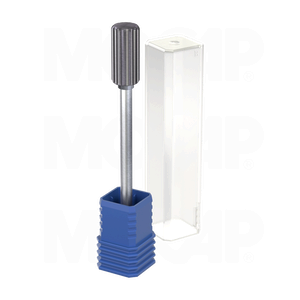 The fins featured inside the base/plug of our Grip Paks provide excellent gripping of the shank and the easy opening cap and heavier wall thickness allows for a secure, perfect fit. They offer ultimate protection for high quality delicate micro drills and cutters. Grip Pak bases are manufactured in Low-Density Polyethylene (LDPE) and the clear caps are manufactured in Clarified Polypropylene (PP). Contact Cleartec Packaging at 800.817.8967 for pricing, special orders and product information.